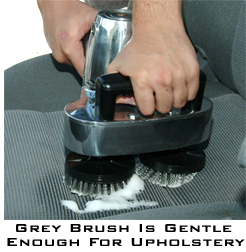 Use your Cyclo polisher to clean carpet, upholstery, and more! The Cyclo is one of the most versatile machines we offer! It can be used to polish and buff your vehicle, and clean carpet, upholstery, and grout. Simply attach two Cyclo Brushes to the heads and start cleaning! The rotating motion of the Cyclo’s heads combined with the high quality brushes easily extracts spots from leather and fabric upholstery and carpet. The brushes are available in four varieties to suit your cleaning needs. Each brush is made of durable nylon bristles modified for specific applications. Use your favorite carpet or upholstery shampoo with the Cyclo brush to remove tough stains from your vehicle or your home. Aqua Soft Carpet Brush: This brush is an all-around carpet scrubber. It has medium crimped bristles for gentle but thorough cleaning. It loosens and removes spots and stains from most types of carpet. White Standard Carpet Brush: This brush is meant for rigorous scrubbing of durable carpets. The bristles are stiff enough to dislodge old stains and they will hold up better than the Soft Carpet Brush on heavy duty carpet. You can also use this brush on tile, grout, and floor pads. Black Stiff Scrub Brush: The black brush has very stiff bristles and is meant for intense scrubbing of hard surfaces. Use it on tile, grout, stone floors, and truck bed liners. The Cyclo Brushes also attach to the Porter Cable 7424. Remove the backing plate and screw in one brush head for on-the-spot cleaning. Remember that the Cyclo requires two brushes. Customize your Cyclo with these changeable brushes for twice the cleaning power! The Cyclo brushes will scrub stubborn spots and stains from carpet, upholstery, and grout without tedious hand scrubbing.